The Box is back in the UK. 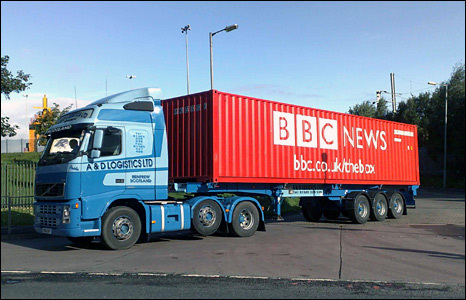 For a period of over a year the BBC monitored their very own 40 foot shipping container as it travelled around the world carrying goods across oceans via intermodal transport. It was all to try and tell the story of globalization through the one defining symbol of the interconnected system of global trade – the intermodal shipping container. It started it’s journey loaded with Scotch Whiskey headed for Shanghai China, and visited ports in Singapore, Bangkok, New York and Los Angeles and long stay at idle in Yokohama. Along the way it provided the context for discussions about piracy, the decline of the global economy and it’s effect on global trade and highlighted to the kinds of goods being made for cheap overseas and shipped to the west.